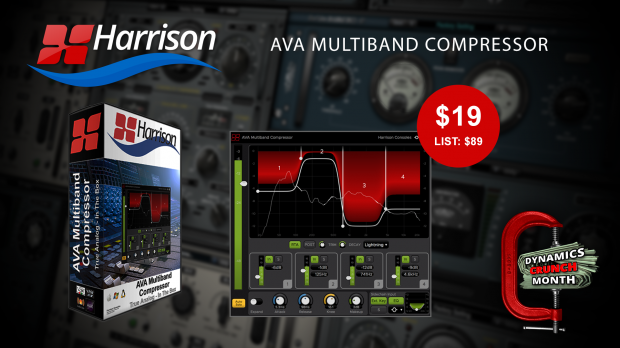 The AVA Multiband Compressor is THE compressor used in high-end music, film, broadcast, and video-post production. Now available at 80% off the list price during “Dynamics Crunch Month”. Here is your chance to get Eventide’s unearthly reverb Blackhole for only $29. Be quick to act, this flash sale ends at midnight April 14th. This extraterrestrial reverb is capable of creating space-warping special effects and drones. Blackhole breaks the rules by allowing you to create virtual spaces that could never exist in reality. Blackhole is a massive reverberator that has evolved over the years by pulling in mass quantities of time and energy (of the development persuasion, of course). In its earliest incarnation – first in the DSP4000 and later in the H8000 flagship processors – it was regarded, by some, as a secret weapon. 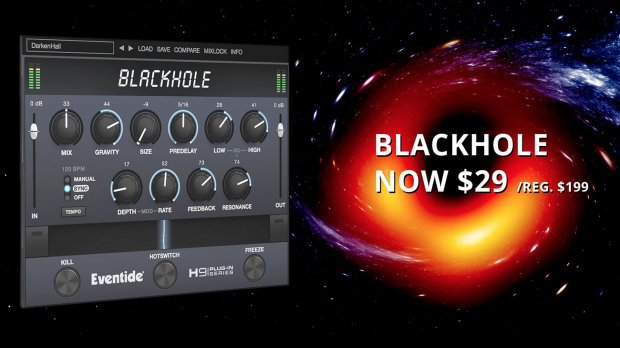 Now the crazy reverb soundspace of the Blackhole can be yours at a out of this world price. 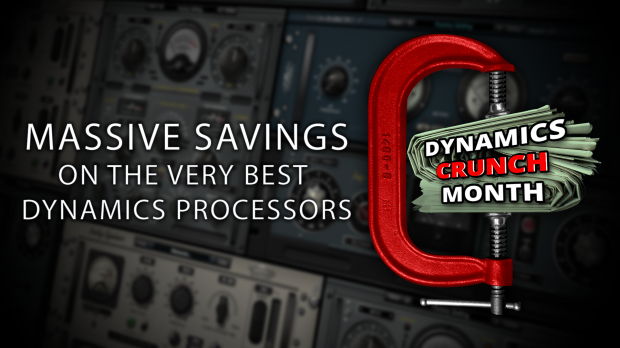 Throughout April we are crushing and crunching prices on Dynamics processors ! 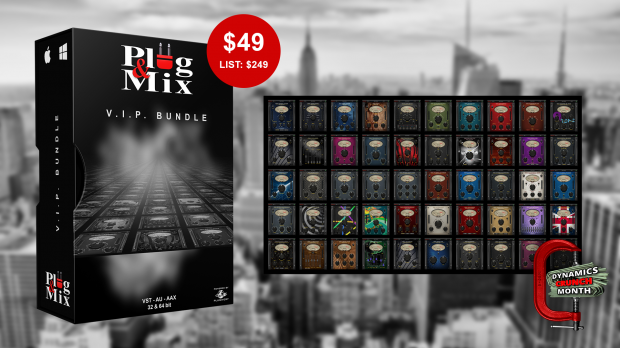 Here is your chance to pick up some essential mixing tools at bargain prices, so don’t miss out on these exclusive specials. Keep visiting this page often as other promos are added each week. To have a great sounding track these days, your mixes have to be the best they can possibly be. Nothing is more important than making your tracks ‘loud and proud’. 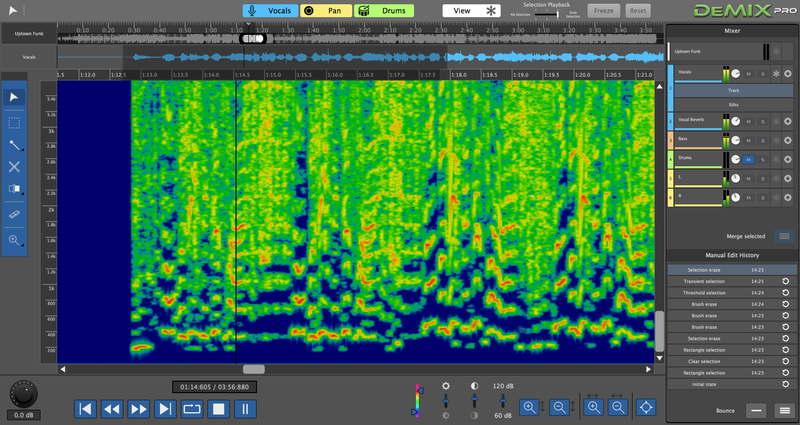 We have contacted all our friends, at various manufacturers, to ask if they want to highlight their latest Dynamics processor plug-ins so you can try them out and then pick them up at a great ‘Dynamics Crunch Month’ price. Be sure to check on all the upcoming “DYNAMICS CRUNCH MONTH” promos here as they arrive. 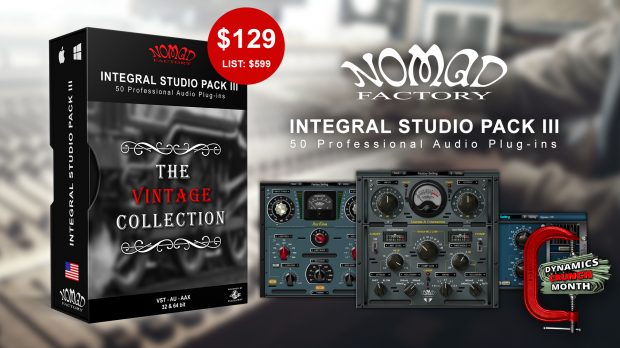 Integral Studio Pack III contains all the famous Nomad dynamics processors and much more. Save over 80% off the list price during “Dynamics Crunch Month”. 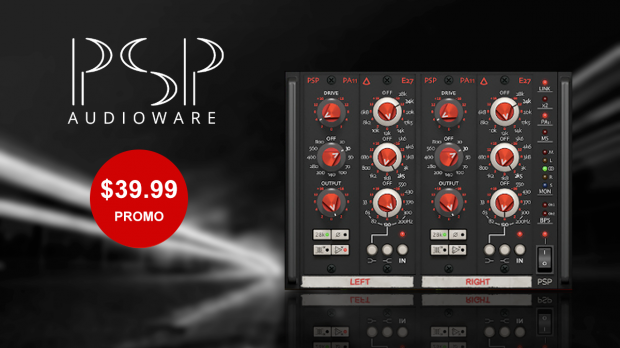 Compressors, Limiters, Maximisers, and all the other audio Mixing tools you need are in the ISP III. 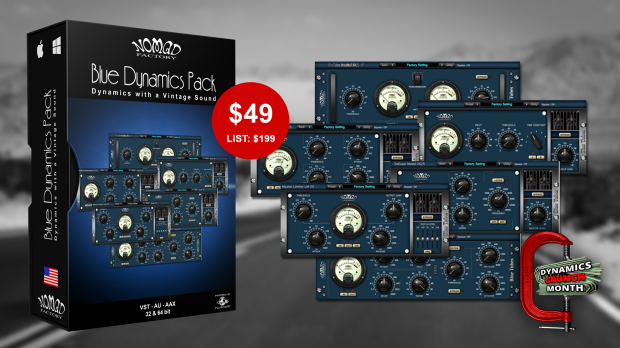 From the warm analog sound of the new Blue Tubes Bundle V3 to the professional processing capabilities of the Analog Signature Pack. 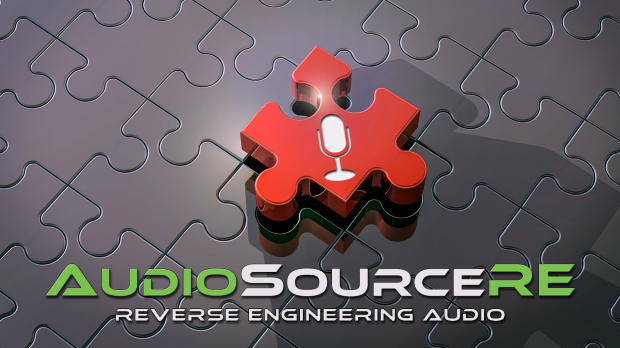 it includes as well the complete Liquid Bundle 2, the beautiful BlueVerb DRV-2080, the essential Studio Suite for even more great audio processing. All this plus the the new Analog Mastering Tools and the Retrology Series, not to mention the highly regarded, Cosmos. 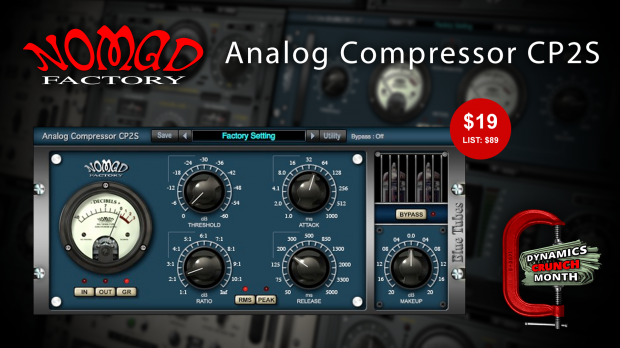 The Blue Tubes Compressor CP2S has the best sounding emulations of the warm sound qualities of classic dynamic analog hardware all in one pack. Now on sale during “Dynamics Crunch Month” at 75% off the list price. The BT Compressor CP2S emulates analog tube compressors in terms of looks, functions and sound including RMS and Peak compressions. The warm analog sound of the BT Compressor CP2S is something you need to hear for yourself. 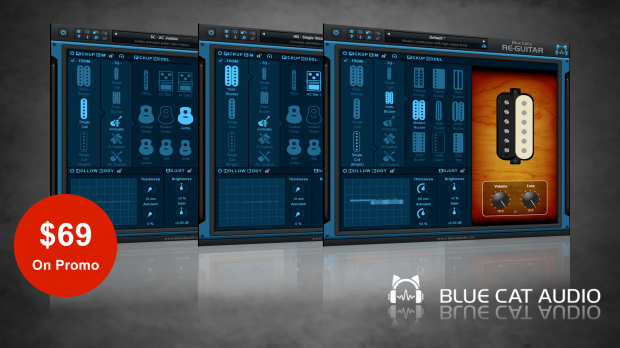 Blue Cat Audio today announced Blue Cat’s Re-Guitar, a new guitar tone modeling plug-in capable of emulating an infinite number of guitars out of a single instrument. Available for at the introductory price of only $69 (List $99) until the 10th of April. Get Blue Cat’s “Re-Guitar” Here ! “Re-guitaring” can be used to enhance or completely modify the guitar tone while playing your own instrument, or to virtually switch guitars after recording – just like we already do with guitar amp simulations. 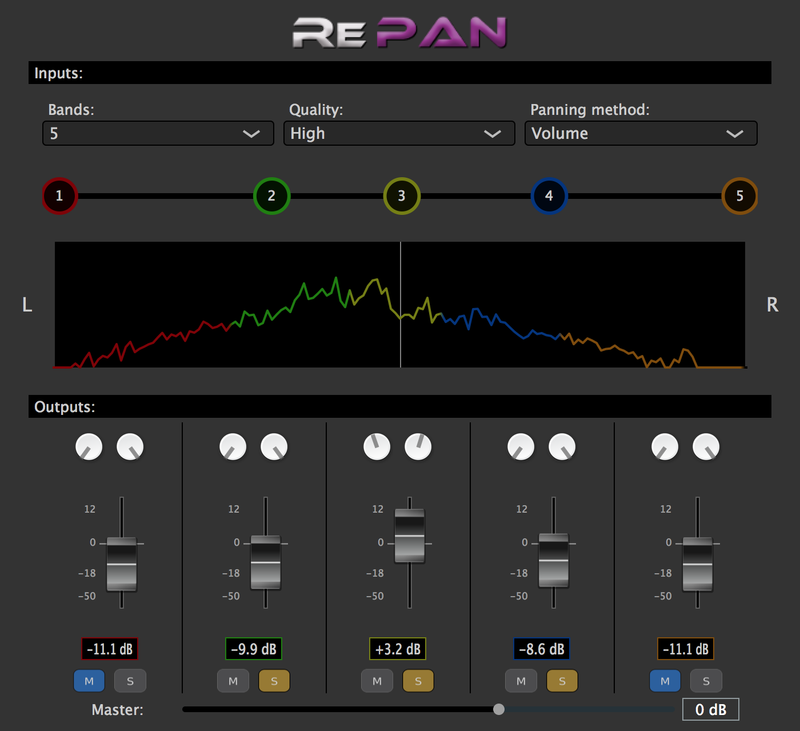 Re-Guitar is now included as a built-in plug-in inside of Blue Cat’s Axiom 1.2 multi effects processor for guitar and bass that was updated today. It is also available separately as an independent plug-in, alone or within the Axe Pack guitar software bundle. A special intro offer is available for Re-Guitar, Axiom and the Axe Pack Bundle until April 10th.